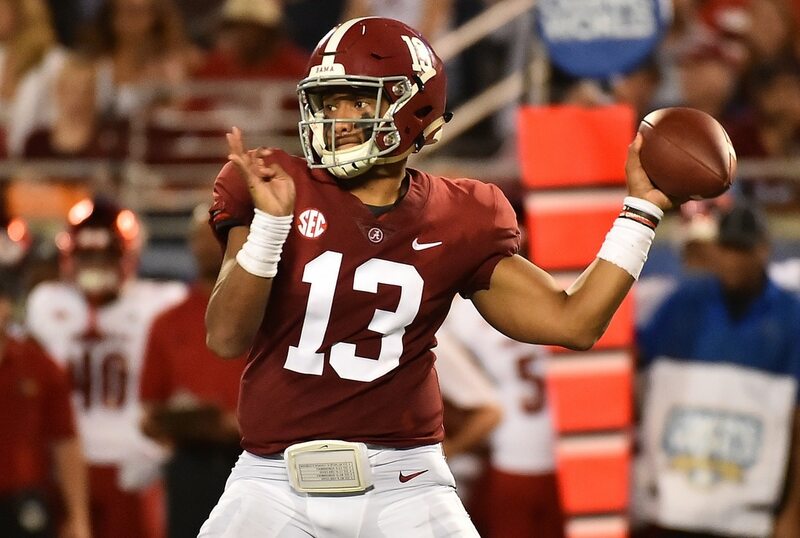 Tua Tagovailoa took off on a scramble in the third quarter as Alabama hosted Missouri Saturday night, and after he slid on the turf he stayed down. As Tagovailoa was attended to by trainers, his right leg was being looked at. Thankfully after a few minutes of being examined, he was able to jog off the field under his own power. Tagovailoa jogs off the field. He was wearing a neoprene sleeve on his knee on that run. He had a much bulkier brace on in the first half. Jalen Hurts came into the game to replace Tagovailoa, who had already thrown for 265 yards and three touchdowns, including an 81-yard bomb on the game’s second play from scrimmage. After Tagovailoa exited the game, he went into the medical tent for further treatment. Tua's mom in the tent with her son. I don't know if that means anything. But it's not common. Thankfully, it looked like he was okay after he exited the tent, though it’s been reported he won’t re-enter the game. Not going back into the game.